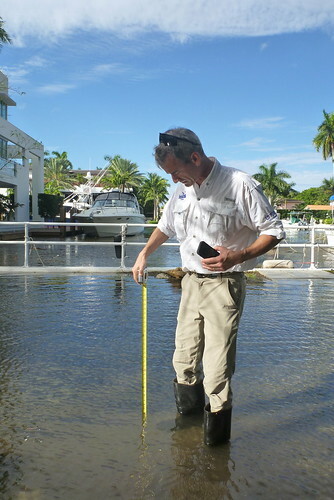 Florida Sea Grant’s programs related to sea-level rise focus on helping coastal communities prepare for the adverse effects that are occurring now and might become worse in the future. This page provides links to useful resources for coastal businesses and communities that desire professional assistance in planning for how to deal with various impacts of sea-level rise. Q: How quickly is sea level rising? consideration what might happen if there is catastrophic melting of polar ice. Q: Are rising seas already having negative impacts in Florida? A: Yes. In the lower east coast metropolitan areas of Florida, flood control structures no longer can operate as designed, and inland properties housing millions of people are at higher risk of flooding. Some areas of downtown Miami, Hollywood and other coastal cities routinely are under water at lunar high tide. Rising sea levels have resulted in salt water getting into wells that provide drinking water to cities, creating a need to move those wells farther from the sea. Sea-level rise is already having an impact on people’s quality of life, on buildings and roads, and on our state’s economy. Q: What will affect sea-level rise in the future? A: The future rate of sea-level rise depends on what happens at a global scale to reduce the inputs of carbon into the atmosphere. Further, the rate depends on factors including how quickly the ocean responds to changes in the temperature of the air and the degree to which polar ice and glaciers melt. It is likely that in the future, sea level will rise faster than in the past, but the exact rate is not known. The incidence of flooding in our coastal areas has increased dramatically over the past decades, as cataloged in the report titled “Sea Level Rise and Nuisance Flood Frequency Changes around the United States,” from the National Oceanic and Atmospheric Administration and the report titled “When Rising Seas Hit Home,” from the Union of Concerned Scientists. And the trend of increasing sea-level rise will continue, as indicated by the Unified Sea Level Rise Projection of the Southeast Florida Climate Compact, the Recommended Projection of the Sea Level Rise in the Tampa Bay Region by the Tampa Bay Climate Science Advisory Panel, Global and Regional Sea Level Rise Scenarios for the United States by the National Oceanic and Atmospheric Administration, a short paper by geologist Dr. Hal Wanless called The Coming Reality of Sea Level Rise: Too Fast Too Soon, and many other sources. 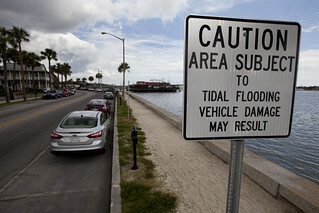 Florida Sea Grant helps businesses, residents and communities in the coastal zone understand the risks of rising seas, and how they can develop plans that will reduce future impacts. We support planning and policy research so that coastal communities become more resilient to hazards. We also provide training for professionals, tools that are used interactively with communities to assess risk, and even policy language that can be used in updating comprehensive plans. These links will take you to pages where that information is provided in detail. This book offers an in-depth examination of the cycle of sea levels in the past and the science behind the current measurements and the future projections. The authors assess the most likely range of sea level rise in Florida based on a synthesis of projections for the next hundred years. They also discuss ongoing and potential consequences for natural marine and coastal systems and how we can begin to plan strategically for the inevitable changes. This report provides an overview of the state of knowledge concerning the science of climate change, emphasizing new results since the publication of the IPCC Fourth Assessment Report in 2007.